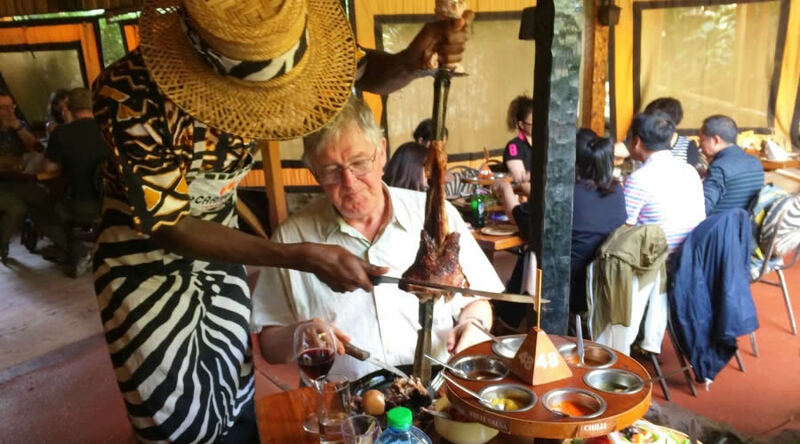 Treat yourself to a unique dining experience at Carnivore Restaurant in Nairobi. Enjoy the ambience of this meat-eater’s haven located 3 miles (4km) outside of the city. Pick-up for lunch beings at noon from your centrally located Nairobi hotel. Start your culinary adventure with pick up at your centrally located Nairobi hotel. Drive about 3 miles (4km) outside the city to the famous Carnivore Restaurant. Enter the rustic atmosphere of Carnivore with it’s rough hewn beams, wooden decor and roasting pit. Take your seat upon Zebra striped chairs. Prepare to feast as servers donning zebra striped aprons and straw hats, carrying Masai swords, greet you. Start your lunch with the soup of the day, home-baked brown bread and butter. Let the feeding frenzy begin as an army of carvers fill the sizzling, cast iron plates in front of you. Savor the specialities such as haunch of ostrich, crocodile, Chicken Tikka, leg of lamb, Chicken Yakitori, pork spare ribs, a variety of sausages and more. Pair these delicacies with a wide selection of salads and vegetable sides. Try one of the many sauces available on the double-story, revolving tray in the center of the table. Finish your meal with a tasty dessert and cup of coffee. Raise the white flag, perched atop the center of the tray, to declare you are full. Participate in this fun, time-honoured Carnivore Restaurant tradition. Say goodbye to the friendly staff of Carnivore Restaurant satisfied by both the bountiful meal and memories. Return to your hotel in Nairobi by your driver .